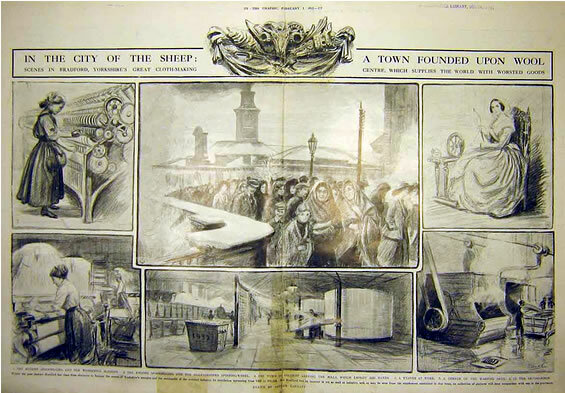 Newspaper caption: In the city of sheep, a town founded upon wool. Scenes in Bradford, Yorkshire's great cloth-making centre, which supplies the world with worsted goods. Date unknown. In the November 27, 1852 edition of his twopenny weekly magazine Household Words, Charles Dickens gives this lively fictionalized account of Sir Titus Salt’s innovative manufacturing of alpaca fiber. I hope that you will find it as entertaining and enlightening as I have. first ancestors had migrated thither. consideration of the price offered. quality) from the grim old church-yard. quiet purchaser had departed, C. W. and F.
all their clerks a holiday. whole of his time and energies. in this country, but as yet unsuccessfully. and giving promise of multiplying. is known by its extreme brightness and softness. linen, wool, and even silk. for ladies’ dresses and waistcoat pieces. within the reach of the most humble. from it are sold at one half the old price. make one forget the colour of the smoke. wet trousers, or I am much mistaken. many over-grown school-boys lounging about. extensive national school for adult pupils. rich and lustrous as the best silk patterns. green valley as is to be seen for many a league.